Seventy-five freshly extracted sound human maxillary central incisors were collected. All the teeth were cleaned of calculus, surface deposits and were stored in 10% neutral formalin and used within 1 month of extraction. Endodontic access cavity preparations were made on all teeth using a high speed rotary hand piece (NSK Dental Corp, Nakanishi, Japan) and an Endo access bur no: 2 (Dentsply, Malleifer, Tulsa Dental, Tulsa, USA). 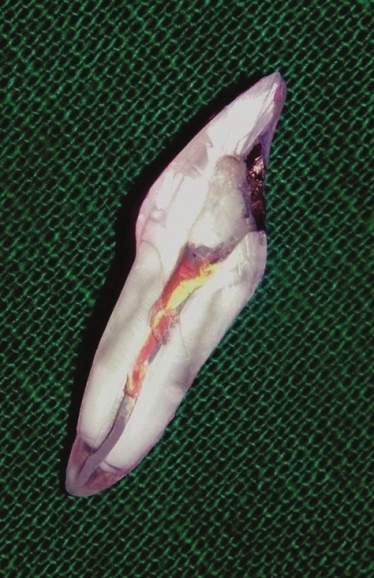 Necrotic pulp tissue was removed with a barbed broach (Dentsply, Malleifer, Tulsa Dental, Tulsa, USA). A No: 10-K file (Dentsply, Malleifer, Tulsa Dental, Tulsa, USA) was placed in the canal to establish the patency of the foramen and working length for biomechanical preparation was determined by substracting 1 mm from the length achieved with the tip of the trail file just visible at the apical foramen of the tooth and the radicular space preparation was performed upto No: 40 size K-file following step back technique in all the teeth. During the process 19% ethylene diamine tetra acetic acid (EDTA) (MD-ChelCream, META Dental corp, Biomed, Cheongju, Korea), copious amounts of 3% sodium hypochlorite (Vishal Dentocare Pvt Ltd, Ahmedabad, Gujarat, India) and normal salines were alternatively used to irrigate the canal between the changes in the file size. Canals were then dried with absorbent paper points and were coated with a thin mix of AH [Amine Hydroxy] plus sealer (Dentsply, Maillefer, USA). In all the teeth, no: 40 size gutta-percha points (Dentsply, Maillefer, USA) were used as master apical cone and were obturated in lateral condensation technique using accessory gutta-percha points. Surfaces of all the teeth were double coated with cyanoacrylate glue except 1 mm around the circumference of the access cavity. All the teeth were equally divided into five groups following stratified randomization and double-blinded trail. Each group consists of 15 teeth, of which 10 teeth were served as experimental specimens and 5 teeth as control specimens as summarized in [Table 1]. In all the experimental group specimens, 30% hydrogen peroxide liquid (Dentsply De trey, Knstanz, Germany) and sodium perborate monohydrate powder (Degussa, Hanau, Germany) were freshly mixed in volume ratio of 1:3 into a paste form and were placed in the pulp chamber. In all the control group specimens, no bleaching agent was placed in the pulp chamber instead dry cotton pellets were placed. Access cavity openings of all the teeth in each group were sealed with three millimeter thickness of one of the five temporary tooth restorative materials being tested respectively, irrespective of either experimental or control group specimens as summarized in [Table 1]. The teeth were then removed from the dye solution and were thoroughly rinsed under running tap water for 5 min, dried and the cyanoacrylate glue was completely removed with a scalpel. All the teeth were longitudinally sectioned in a mesio-distal direction with a diamond disc of 0.3 mm in thickness (Salvin dental, Oklahoma, USA) at a speed of 20,000 rpm under copious water irrigation. The depth of linear dye penetration was observed with stereomicroscope (Stemy SV8 Zeiss, Germany) of magnification ×10 equipped with a micromeasure grid and the measurements of dye penetration were carried out by the same operator. Dye penetration not reaching the pulp chamber. Dye penetration reaching the pulp chamber. Loss of temporary restorative material from the occlusal access. Statistical analysis was done using Kruskal-Wallis test and Mann Whitney U test. 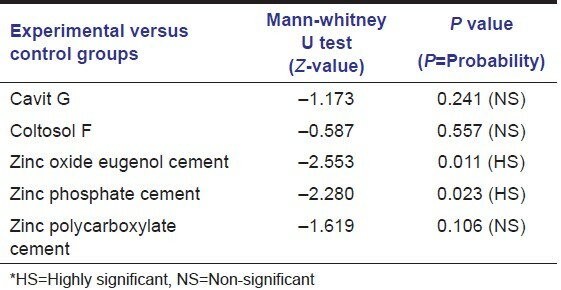 Comparative analysis of the experimental and control group specimens within each group was done using Mann-Whitney U test and is presented in [Table 2]. Kruskal-Wallis test was done to see whether there was any significant difference between the experimental groups and the statistical analysis showed that there was a significant difference between the experimental groups of five different temporary restorative materials used. Kruskal-Wallis test between the experimental groups shows that Cavit G exhibited the minimal leakage values in the dye penetration tests with a mean of 13.30 followed by Coltosol F with 16.20, zinc polycarboxylate cement with 25.70, zinc oxide eugenol cement with 34.80 and maximum leakage value of dye penetration was exhibited by zinc phosphate cement with a mean of 37.50. The mean value among the experimental groups showed a highly significant difference as the P value was 0.001. So to find out where the significant difference was, Mann-Whitney U test was done comparing the dye leakage values of only the experimental group specimens and is presented in [Table 3]. Kruskal-Wallis test between the control groups shows that Cavit G exhibited the minimal leakage values in the dye penetration tests with a mean of 8.20, followed by Coltosol F with 12.10, zinc polycarboxylate cement with 12.40, zinc oxide eugenol cement with 14.20, zinc phosphate cement with 18.10. The mean value among the control groups was not significant as the P value was 0.202. So it was not required to go for the Mann-Whitney U test between the control groups. Non-vital bleaching technique suggested by Spasser  in the year 1961, uses a mixture of sodium perborate and water in paste form placed in the pulp chamber of tooth between dental appointments. Perborate in this state breaks down into sodium metaborate and hydrogen peroxide. The later finally degrades into water, free radicals and oxygen thus allowing the release of the primary oxidizing agent. Nutting and Poe  in 1963 suggested mixing of sodium perborate with 30% hydrogen peroxide to enhance the bleaching effects. This method was referred to as the walking bleach technique and it was believed that the combination of these two oxidizing agents would be synergistic and more effective in bleaching the tooth. Microleakage between the restorative materials and tooth surface can be evaluated by several methods and they include dye penetration tests, fluid filtration methods, radioisotopes, electrochemical methods, fluroscent microscopy, resin infiltration methods, and chemical tracers. Of these, dye penetration method was the most widely used as it is simple and reproducible. So in the present study, linear dye penetration method was used and the dye utilized was 1% India's ink. Usually methylene blue or rhodamine-B solutions are used for dye penetration tests. However, these two dye solutions were decolorized by the bleaching paste mixture when used in our pilot study and 1% India's ink dye was scarcely discolored and thus we chose it to use in our study. To simulate fluctuations in temperature changes of the oral cavity, thermocycling was included in the present study as it has been reported by Bobotis  and McInerney  that temperature fluctuations can adversely affect the marginal sealing ability of temporary restorative materials. As Webber  suggested a minimum thickness of 3 mm for any temporary restorative material to achieve a superior marginal sealing ability. So in the present study we standardized the thickness of all coronal temporary restorative materials used to 3 mm. Marosky  found a correlation between ease of handling and sealing ability of the temporary restorative materials. It was noted that the premixed cements allowed less marginal leakage and showed better sealing ability, as fewer chances for manipulative errors with premixed cements than those cements that depend upon the investigators skills in mixing powder-liquid components of the cements. However, there was no statistically significant difference in the leakage values following dye penetration tests between Cavit G [Figure 2] and Coltosol F neither in their experimental nor in control group specimens of group A and B.
Naoum and Chandler  reported that the sealing ability of zinc phosphate cement is inferior to Cavit G, zinc oxide eugenol cements and Gilles et al,  reported that, when Cavit G and zinc oxide eugenol cements were subjected to thermocycling, Cavit G showed minimal dimensional changes, whereas zinc oxide eugenol cement showed large dimensional fluctuations following thermocycling. However, Krakow et al,  in an in-vivo study evaluated the sealing ability of Cavit, Caviton, Gutta-percha, zinc phosphate cement and zinc oxide eugenol cements and reported that Cavit, Caviton and zinc phosphate cements showed no or minimal dye leakage and Gutta-percha showed the maximum dye leakage in the dye penetration tests. In five of the experimental specimens of group D, where zinc phosphate cement was used as temporary restorative material, there was a loss of restorative material from the occlusal access. Whereas in control group specimens, there was no loss of restorative material from the occlusal access. 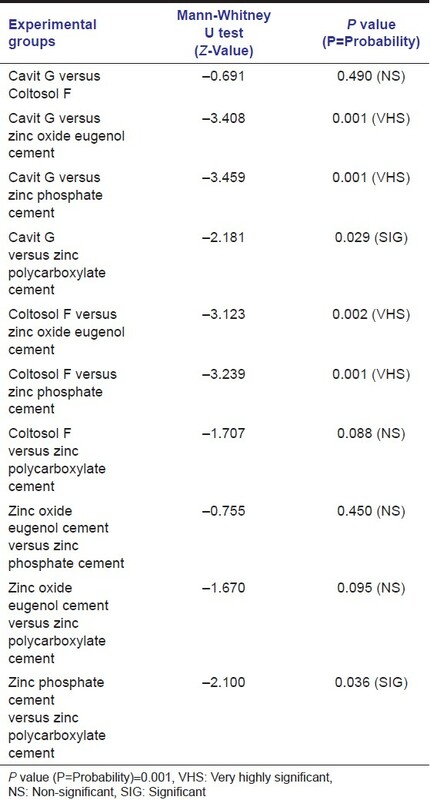 However, there was a significant difference in the leakage values between experimental and control group specimens as leakage values were minimal in the control group compared to experimental group specimens, which indicates the definite effect of the bleaching paste mixture on its contact with the zinc phosphate cement [Figure 3]. In three of the experimental specimens of group C, where zinc oxide eugenol cement was used as temporary restorative material, there was a loss of restorative material from the occlusal access. Whereas in control group specimens, there was no loss of restorative material from the occlusal access, which indicates the definite effect of the bleaching paste mixture on its contact with the zinc oxide eugenol cement. So in the present ex-vivo study, it can be inferred that zinc oxide eugenol and zinc phosphate cements were more strongly influenced by the effects of bleaching agent and to a certain extent, zinc polycarboxylate cement also got affected from the bleaching agent. Noguera  in an in-vitro study compared the sealing ability of Cavit G, IRM [Intermediate restorative material and TERM [Temporary endodontic restorative material], with TERM showed the least dye leakage, compared to Cavit G and IRM at the tooth-restoration interface in the dye penetration tests. Waite  evaluated the sealing ability of TERM as interim restorative material for walking bleach technique when using either sodium perborate/water or sodium perborate/superoxol. TERM provided an unsatisfactory seal when used with walking bleach technique. However, when used over dry cotton pellets, TERM provided an excellent seal. Deveaux  evaluated the sealing ability of Cavit, IRM and TERM in bacterial micro-leakage in-vitro study involving thermo-cycling. IRM and Cavit showed maximum bacterial penetration, whereas TERM remained leak-proof. However, in the present study, the hydrophilic temporary restorative materials Cavit G and Coltosol F were not affected by the effects of bleaching paste mixture and also withstood temperature changes much better compared to the other temporary restorative materials used. So both Cavit G and Coltosol F are not only be used as temporary restorative materials in contemporary endodontics, but also offers tremendous scope for their use as coronal temporary restorative materials in walking bleach techniques. Ex-vivo studies definitely cannot duplicate the environment that exists in-vivo. However, these ex-vivo evaluations provide information that aids the clinician in the selection of the best material for specific clinical situations. Both zinc phosphate and zinc oxide eugenol cements were more strongly influenced by the effects of bleaching agent and thermo-cycling on their sealing ability, as they showed maximum leakage values in the dye penetration tests of experimental group specimens compared to the control group specimens. Minimal leakage values in the dye penetration tests were observed with hydrophilic pre-mixed temporary restorative materials of both experimental and control group specimens. As Cavit G and Coltosol F were not influenced by the effects of bleaching agent and thermo-cycling, they offer tremendous scope for their use as coronal temporary restorative materials for the successful outcome of the walking bleach treatment. 1. Hosoya N, Cox CF, Arai T, Nakamura J. The walking bleach procedure: An in vitro study to measure microleakage of five temporary sealing agents. J Endod 2000;26:716-8. 2. Popoff DA, Goncalves FS, Ferreira RC, Magalhaes CS, Moreira AN, Mjor IA. Repair of amalgam restorations with conventional and bonded amalgam. An in-vitro study. J Dent Sci 2010:25;154-8. 3. De Moor RJ, De Bruyne MA. The long-term sealing ability of AH 26 and AH plus used with three gutta-percha obturation techniques. Quintessence Int 2004;35:326-31. 4. Spasser HF. A simple bleaching technique using sodium perborate. NY State Dent J 1961;27:332-4. 5. Nutting EB, Poe GS. A new combination for bleaching teeth. J South Calif Dent Assoc 1963;31:289-91. 6. Mohan KM, Lakshminarayanan L. Methods of detecting microleakage. J Conserv Dent 2004;7:;79-87. 7. Bobotis HG, Anderson RW, Pashley DH, Pantera EA Jr. A microleakage study of temporary restorative materials used in endodontics. J Endod 1989;15:569-72. 8. McInerney ST, Zillich R. Evaluation of internal sealing ability of three materials. J Endod 1992;18:376-8. 9. Webber RT, del Rio CE, Brady JM, Segall RO. Sealing quality of a temporary filling material. Oral Surg Oral Med Oral Pathol 1978;46:123-30. 10. Marosky JE, Patterson SS, Swartz M. Marginal leakage of temporary sealing materials used between endodontic appointments and assessed by calcium 45 - An in vitro study. J Endod 1977;3:110-3. 11. Naoum HJ, Chandler NP. Temporization for endodontics. Int Endod J 2002;35:964-78. 12. Gilles JA, Huget EF, Stone RC. 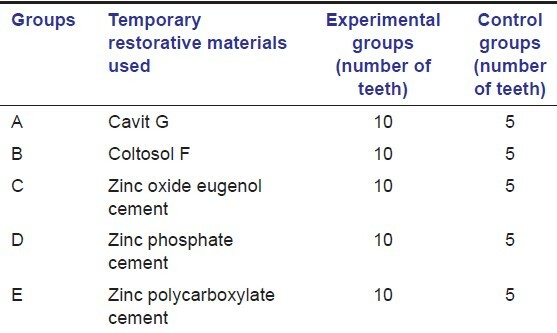 Dimensional stability of temporary restoratives. Oral Surg Oral Med Oral Pathol 1975;40:796-99. 13. Krakow AA, de Stoppelaar JD, Gron P. In vivo study of temporary filling materials used in endodontics in anterior teeth. Oral Surg Oral Med Oral Pathol 1977;43:615-20. 14. Noguera AP, McDonald NJ. Comparative in vitro coronal microleakage study of new endodontic restorative materials. J Endod 1990;16:523-7. 15. Waite RM, Carnes DL Jr, Walker WA 3 rd . Microleakage of TERM used with sodium perborate/water and sodium perborate/superoxol in the "walking bleach" technique. J Endod 1998;24:648-50. 16. Deveaux E, Hildelbert P. Bacterial microleakage of Cavit, IRM, and TERM. Oral Surg Oral Med Oral Pathol 1992;74:634-43.